In our quest to better understand sustainable living, Kristi and I visit David Holmgren’s property. We get to tour his off-grid home, walk around his permaculture gardens, and of course listen to his thoughts about sustainability and how to live better lives in a quickly changing world. David Holmgren, simply stated, is one off the two originators of the permaculture concept. Back in the 1970’s, he and Bill Mollison co-authored the first publication on the subject, Permaculture One: A Perennial Guide for Human Settlements. Permaculture – or “Permanent Agriculture” – is a system of design that uses patterns and features observed in natural ecosystems. At a high level, it follows the belief that nature creates harmony and balance as opposed to artificial man-made setups (think 100 acres of corn, a facility that processes only chickens, etc.) that have no balance and require constant intervention and management. For more information on this topic, see my Heretics Unite post. Today, David continues to write on the subjects of environmental design, runs routine tours of his Melliodora property, and is regularly involved in teaching permaculture design at least six different permaculture design programs, including the one at CERES that Kristi is currently taking. The first and most important consideration for building an energy efficient home is orientation. Quite simply put, this means that the house must face the equator. In Australia, this means to the north. In the case of David’s home, this means that the back of the house is actually facing the road. This stands in stark contrast to the way neighborhoods are organized in the modern day era. Houses almost always face the road, often times making the home far less efficient in its energy consumption and, as such, more expensive to operate. As you might imagine, David’s home uses passive solar heating. This means that the front of the house has lots of windows, whereas the back does not. The walls are made of a material that has high density and heat capacity so as to store the heat that is collected during the day and release it during the night. For more discussion on how passive solar heating works, view my post on Earthships. Specifically, the walls of David’s home are constructed using mud brick. 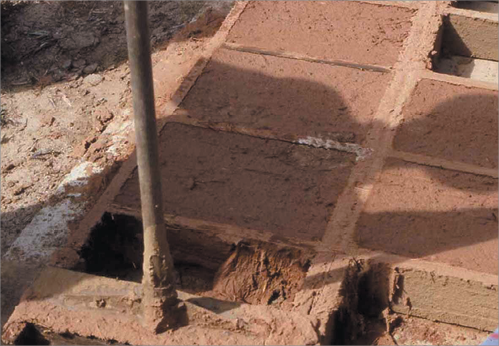 Mud bricks are made by mixing water, earth, and straw or fibers (for strength) and placed into molds and left to dry. Once dry, the bricks are stacked using mortar in between each brick, and eventually are finished with a mud slurry for sealing and waterproofing. Functionally, the benefits of mud brick are that they are load bearing, provide the thermal mass necessary for heat retention, are fire resistant, and are durable and moisture resistant. Aesthetically, they can take on many appearances based on the mix being used, but in all cases have a very nice earthy appearance. From an environmental standpoint, they are often described as the most environmentally friendly construction material that can be used. And from a cost perspective, the material costs are negligible because they can often be sourced right on-site. However, it’s worth mentioning that they are very labor intensive to create and stack. Finally, some sources say that mud bricks are also insulating, but according to David this is not the case. In the picture below, one can see the extensive use of windows across the front of the home. One thing that struck me as different from the Earthship approach to passive solar heated homes is the specific usage of the greenhouse. In Earthships, the windows run the entire length of the front of the house, with a second set of windows running behind that so that the greenhouse is essentially sandwiched between the front of the house and the interior. 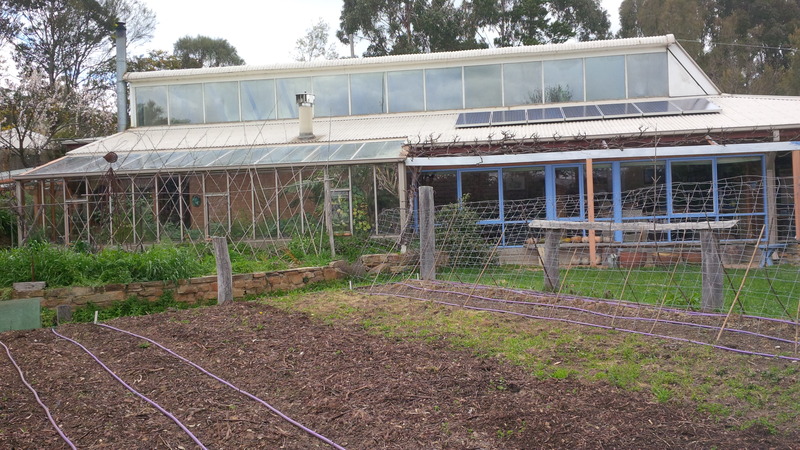 In David’s home, the greenhouse only spans half of the front of the house and there is actually a mud brick wall separating the greenhouse from the interior. When asked about this, he stated that the front mud brick wall is the most important wall for retaining heat. This makes sense since it stands in direct sunlight for the entire day. This wall soaks in all that heat from the greenhouse and then releases it into the living area all night long. At one point during the home tour David wife’s, Su Dennett, mentioned that a passively heated home really means “Passive home, active people.” In other words, it’s not set-it-and-forget-it. There are several louvers throughout the home that can be opened and closed to allow varying amounts of circulation from the outside. During the cooler months of the year, the greenhouse (and its condensation) must be vented in the morning through the vent pictured above, and then the slider door between the greenhouse and kitchen is opened to allow the warm air into the house. I thought this was a good point to take home in that although the name passive solar heating implies no work, it does require regular routine by the inhabitants to keep it running optimally. David and his wife use a wood stove for all their cooking needs. Because of the warmer climate in Australia, the chimney coming off the stove is run up the outside of the house so that too much heat doesn’t radiate to the interior. Throughout their property, there is often times enough wood clippings produced by the trees that they don’t feel the need to grow trees specifically for wood harvesting. Granted, he jokingly admits, it’s not “Man’s wood,” it gets the job done and they have plenty for use on a daily basis. Using a thermosiphon, the wood stove also heats the water used for showers. This is the same sort of setup as what I observed at David Arnold’s property earlier in the year. The only difference is that David does not also use a solar hot water heater, meaning he only gets hot water when there’s a fire going in the oven. David’s home uses minimal amounts of electricity. This is possibe mostly due to the fact that they do not have many appliances, namely refrigeration. In fact, their only refrigerator is a mini-fridge, the same size as the one Kristi and I use! In lieu of a big refrigerator, David uses a cool cupboard. Without getting into details, a cool cupboard works by drawing air from underneath the home and then venting it out the top of the house. It is somewhat analogous to having a root cellar, but instead of it being cooled directly by the earth, the cool air from the earth is ducted into the cupboard using the principal that hot air rises and cold air sinks. He mentioned that one of the pitfalls of making a cool cupboard is that people often times do not make the duct wide enough in order to get the level of airflow required to function. However, properly setup the cupboard will stay cool all year round and reduce or eliminate the need for mechanized refrigeration. As with most self-sustaining homes, David’s uses solar electric power for all its energy needs. David mentioned that one thing he’s notice in the 20 or so years that have passed since constructing his home is that the home has been feeling colder. He spent quite a lot of time trying to figure out the source of the decreasing temperatures and eventually realized it was being lost through the floor. The floor of his home is mud brick finished with a beeswax sealant. Although mud bricks are great at holding heat, water is even better and it turns out there has been some water pooling under the house. He emphasized the importance of making sure you have excellent drainage under the house, or else over time this could become an issue. One of the regrets David has is that he plugged into city water. His wife had wanted to be self-dependent in this regard when they first built their property, especially given the increasing usage of chlorine, fluorine, and other chemicals in our drinking supply. At the time this was not an issue in their town but now it is. Furthermore, water usage rates have gone up along with all other utilities. As such, they have constructed a concrete water tank outside the home and will be soon making the switch to 100% water independence. One of the reasons paint cracks over time is that the type of wood used in home construction often has a high shrinkage value. This means that as wood expands and contracts with varying temperature and humidity conditions, the paint starts to crack. This can be avoided by selecting woods that have low levels of shrinkage. Glass can be used to create a wall by securing glass panels to the frame with silicone. This is a technique routinely used in commercial applications but rarely in home design. He recommends considering this when constructing a greenhouse, as it may make the structure cheaper and more effective. This may be something worth looking more into. One of the first things you learn in permaculture design is the concept of organizing your property into zones according to how frequently you access them. Zone 1 is primarily used for items that you use daily. For David this includes several herbs and vegetables that routinely get used in meals. Since we’re still coming out of winter, many of the planters are currently being seeded for spring crops, hence why they’re barren. In the garden beds located in the foreground of the picture at right, David has planted several vegetables that he hopes will grow in a staged fashion. Pumpkins, which take longer to mature than the other vegetables, should start to climb up and over the garden bed once the first set of vegetables are harvested. One of core principles of permaculture is that everything has multiple purposes. A good example of this is a chicken that produces eggs, protects the garden from weeds and pests, cleans livestock, and picks through vegetable clippings to make compost. Throughout David’s property there was evidence of this everywhere. I asked him what the flowers were that seemed to be growing at the base of all his fruit trees. Daffodils, he explained, do not compete with the tree but do compete with grass, which protects the tree against weeds (grass) encroaching on its space and stealing its nutrients. 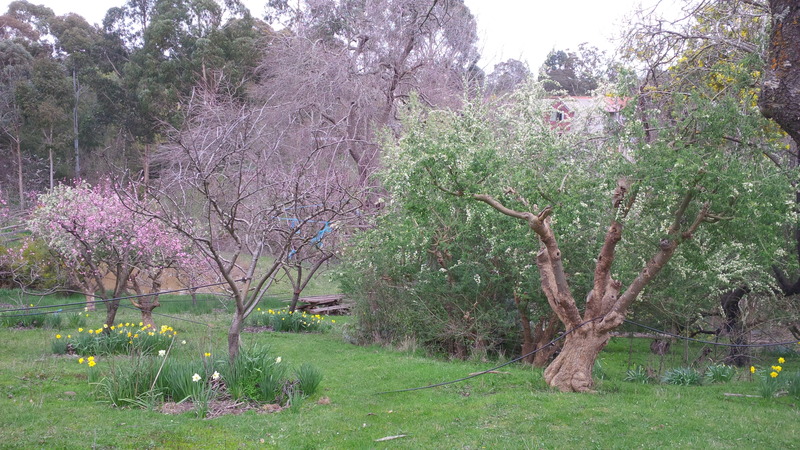 You’ll notice in the above picture that there are also evergreen trees planted intermittently among the fruit trees. These are called tagasaste and, true to permaculture principles, serve multiple purposes. 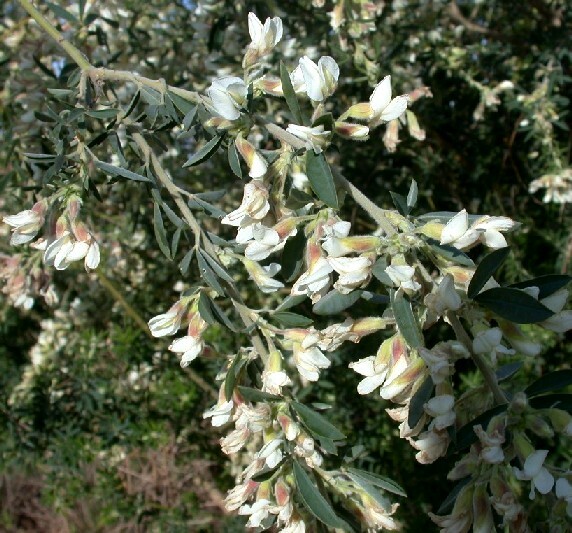 Not only are they superb fodder for goats and other livestock, they are nitrogen fixers, provide good wood clippings for the wood stove, and serve as winter nectar for bees while other trees are dormant. They do have a habit of spreading wildly, but as long as you have goats it won’t become an issue because they will get gobbled right up. David has an outdoor composting toilet that is used for producing manure for the gardens. Therefore, he does not have a toilet in the house. He did make the point that for somebody like him who has a lot of strangers passing through his property, he has to make sure that the compost really sits for an extra long time to guarantee that any contaminants are properly killed. He draws the parallel to airports, which he explains have the dirtiest bathrooms because so many people are all mixing from so many different places, carrying in diseases from all corners of the world. This risk is lowered when your family is the only one using it, but if not you just need to make sure to not rush the composting process. As for urine, he encourages his guests to find a secluded part of his orchard to do their business! Urine is beneficial to plants, a topic that I’ve actually read a lot about and perhaps will be the subject of a future post. In zones further away from the primary residence, you typically find lower-maintenance items such as a dam to hold water. Across the dam one can also see a recent addition to the property: an in-law apartment created for David’s mother to live in. This home was designed to be fully self-sufficient and includes rainwater harvesting from the roof structure. It also makes use of beautiful mud brick construction techniques and passive solar heating similar to those used in the primary residence. 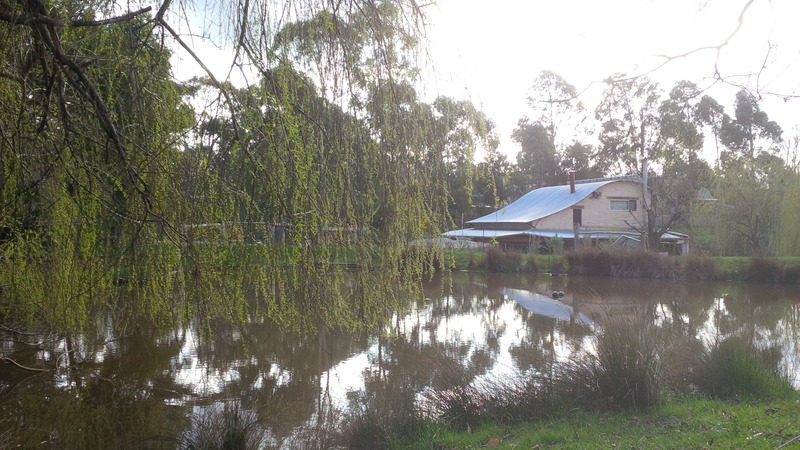 David’s home is an excellent example of systems being self-sufficient and integrated. The house is highly effective at heating and cooling without the need for non-human energy inputs. Passive heating and cooling maintains temperature, solar panels supply what minimal electricity they require, and water will soon come from the sky and not the city. The greywater produced by the house helps feed the garden, and the organization and selection of various plant life throughout the gardens and orchards are purposeful, allowing the family to live with minimal reliance on the outside world. All of this started with a well thought out plan before starting construction, but specific gardening tactics have evolved over the years as the soil and environment have slowly changed. Nature works in balanced harmonies that take eons to work out and, like nature, the harmonies we design for our permaculture systems at home must be amenable to evolution over time. When done properly, it is indeed possible to live in harmony with our surroundings, which enriches the Earth around us rather than destroy it. As an added bonus, it is easier on our bank accounts because when you work with something and not against it, it turns out fewer inputs and interventions are required. It was truly encouraging to visit David’s home and gardens and see first-hand that what is written in books and blogs is indeed possible, and sustainable over long periods of time (going on 30 years at his home). I look forward to continuing to slowly refine my own plans.